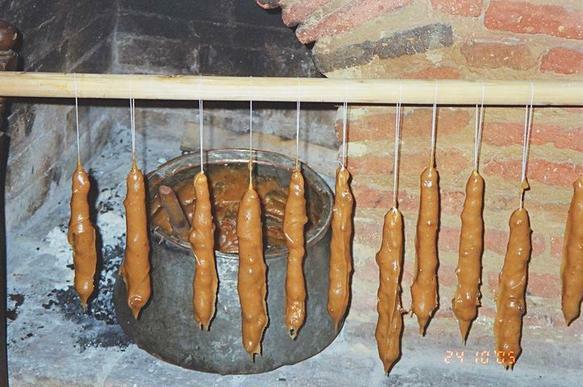 Churchkhela (also written churchkhella, Georgian: ჩურჩხელა, Russian: чурчхела) is a traditional sausage-shaped candy originating from the Caucasus, mainly Georgia, and also common in Russia and Turkey. In Turkish it is called pestil cevizli sucuk, literally walnut sujuk because of its sausage shape. Churchkhela is made of walnuts, hazel nuts, almonds or raisins sewn onto a string, dipped in thickened white grape juice then to caramel and dried in the shape of a sausage.